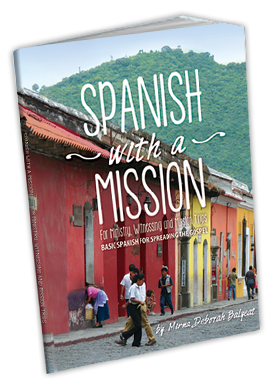 Teaching at church, school or home, this textbook is a valuable resource for teaching Spanish to communicate God´s love! What makes this textbook different from other Spanish textbooks? This is a Spanish textbook with a Christian platform. It teaches Spanish grammar and gives practical thematic vocabulary and exercises. The material is written from a Christian perspective, including religious words and phrases, mission vocabulary, cultural insights, and key Bible verses necessary for Christian outreach and leading someone to Christ. More over, this book contains many Christian choruses and praise songs that can be sung with children or adults. Included are biographies of Hispanic Christian artists and composers. These songs are often heard in Hispanic churches and consequently, used in ministry. They also are a fun way to learn Spanish. Buy yours today, click here! Click here to request the Teacher’s Guide.